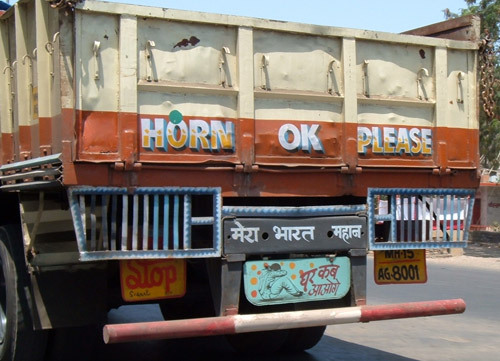 One of the first things most visitors to India will notice (as did my wife and I in the winter of 2011) is the sheer number of trucks there that have the words "HORN OK PLEASE" prominently displayed either on or just below their tailgate. In fact, in just a few hours of our arrival, it became apparent to us that the words are painted on literally every other commercial truck in India - big and small. We learnt from our driver, Mr Singh, that the purpose of the phrase is actually to alert drivers approaching from behind to blow their vehicle's horn in the event they wish to overtake. 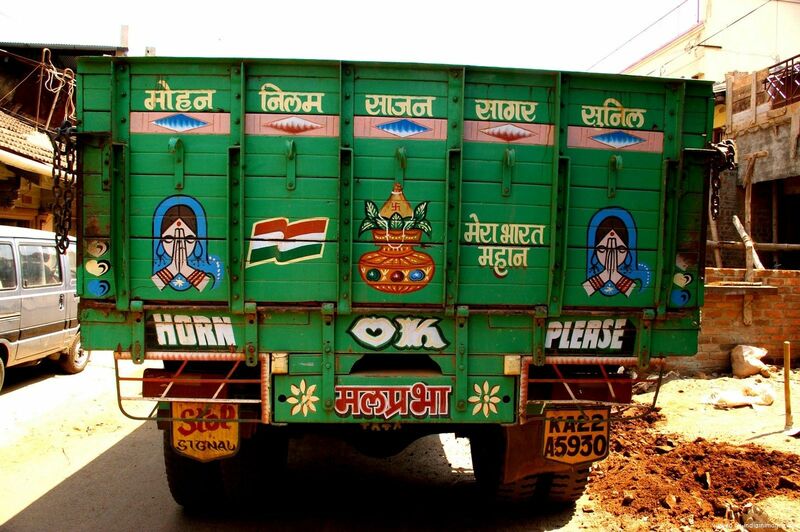 Although there exists no official significance with regards Indian traffic regulations nor any statute mandating the use of the phrase, the tailgate of tens of thousands of commercial vehicles in the country are nonetheless colourfully painted with the three words. To be honest, most of these adornments are really quite pretty, and the varied designs and forms in which they come are both an eye-opener as well as a joy to look at. In some ways, they're really works of art. Personally, I love 'em! HORN if he wishes to overtake from the left. This way, the driver of the vehicle in front is alerted of the passing vehicle - and therefore, will not veer left. If the driver of the trailing vehicle does not intend to overtake, then it is OK (to keep following from behind; all good). If however he wishes to overtake from the right, he may do so without blowing his vehicle's horn. Effectively, the driver of the commercial vehicle in front is saying, "By all means, PLEASE proceed". 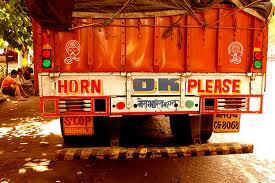 It is therefore no coincidence that the words "HORN", "OK" and "PLEASE" are invariably displayed in that order, i.e. left, centre and right respectively, on the rear of the vehicles. Get it? Funny and queer though this may seem to foreigners like me, the phrase actually makes a lot of sense if you think about it - especially given the absolute chaos of vehicles on Indian roads. You see, although India observes British road regulations (which means keep left and overtake from the right), commercial vehicles here commonly travel on the right lane; and because they're usually slow-moving, drivers approaching from behind are almost always compelled to overtake from the left. Add to that their sheer number and what you get is... BAAARGH!... BEEEEP!... BORRRRP! - an absolutely incessant cacophony of blaring car horns literally wherever you go in India. Truth be told, a road trip in India - long or short - can be a harrowing experience. Her combination of "too few roads, too many cars", sub-standard road conditions in some parts, notoriously impatient drivers and their near-zero adherence to traffic rules can - and will - leave your nerves in tatters, which is probably why the driver of this truck had this message painted on the back of his vehicle. So after seven days of touring the Golden Triangle of India (by which time we'd gotten used to the constant sound of car horns), it was nice to see for a change - on our final road trip back to New Delhi from Jaipur for our flight home - THIS truck which totally blew me away! It's little things and memorable moments such as this that make experiencing foreign cultures - strange as some may seem to the outsider - so richly-rewarding; which is probably why I'm so darned in love with India.... or rather, Incredible India. Drive safe, everyone. 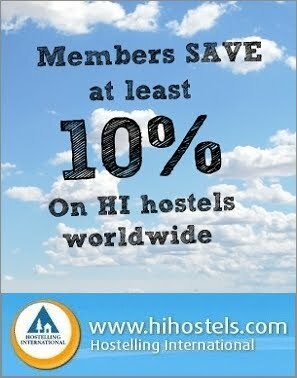 Have you visited India before? If so, what was your reaction when you first saw the phrase? I agree Vincent some of them were beautifully decorated...inside as well as out. The drivers were so proud of them too and very happy to let you take photos. You saw the inside of one??? Wow....why didn't I think of that? Thanks for sharing your thoughts and experience, Kay Dee. 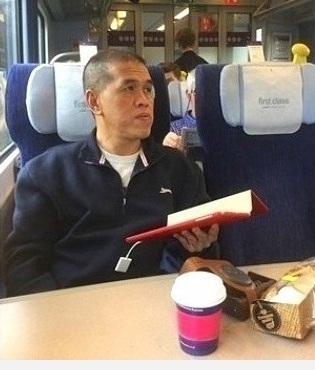 Smart blogger, I must say. Hey, I am a blogger from India, it is good to see someone putting photos of Indian goods career. The quantity of vehicles on our streets has expanded complex and to add to this we need to offer approach to cows, elephants, wild oxen, bull trucks, pigs, auto-rickshaws, pedal rickshaws, goats, bikes, pushcarts, pooches not overlooking the easygoing passerby as well. 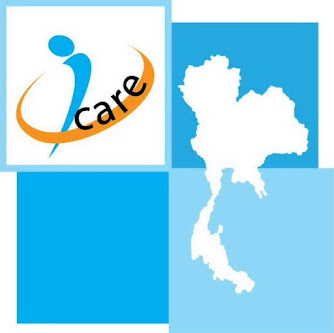 Even though there have been advancements in road and car safety, road traffic accidents are still common place in our society. Unfortunately, statistics show that most people will be involved in a serious road traffic accident at least once in their lifetime. Road traffic safety is a big deal in major cities around the world. There is an alarming increase in road mishaps that occur year after stemming from drunk driving, speeding, driving while experiencing fatigue or other traffic safety violations on the road. The biggest risk involved here is the chance of a road traffic collision. You have described horn ok please term in very nice way. But in actual people from India don't follow any rule. They do their own wish.